We supply Point of Sale (POS) systems for convenience stores. Whether you run a small independent family business or operate a chain of convenience stores, we have a number of different epos systems to suit various convenience store business requirements and budgets. 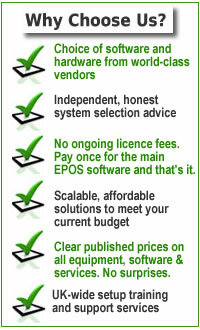 Our best EPoS solutions for convenience stores include all the components you require to setup and operate your business including receipt printer, barcode scanner, cash drawer and EPoS application software are all included. Optionally add mobile scanner, dallas keys or external A4 document printer. We can setup your products structure for groceries, tobacco, soft drinks, confectionery, toiletries, frozen food, stationery and other items that you sell. We also offer remote training as well as on-site installation / training all over the UK as part of our service package. Our systems are designed to handle EAN/UPC barcoded products as well as manually key enter prices for non-barcoded products. Options to print shelf edge labels and your own product barcode labels are also available. Our till systems for convenience stores offer a wide range of features suited to the different types of businesses. Please note that not all features are available on all our systems - check the specification of your intended system if you require a particular feature. Barcode scanning allows you to greatly improve your shop's efficiency and customer service by being able to increase your throughput at the point of sale. With a barcode scanner, there is no need to find, read, key-enter and check the price of each item at the checkout. Simply scan the barcode and the item with its description and price will automatically be added to the sales transaction. Your customers will be more satisfied with a faster service, your receipts will be itemised and you will have fewer pricing errors and keying mistakes, as well as reports information for sales and stock levels being instantly updated. We offer various types of barcode scanners for retail use including basic hand-held scanners, handsfree barcode scanners with a stand, wireless Bluetooth or RF barcode scanners and integrated counter scanners for busy supermarkets from Honeywell / Metrologic, Motorola Symbol, Datalogic, Wasp and other leading barcode scanner manufacturers. To recognise a barcode, it would need to be pre-programmed onto the system with associated product information such as Description, Price, Tax Rate, Department, Minimum Stock Level, Cost Price, Supplier and so on. For some types of business (eg. convenience stores, newsagents, supermarkets) we can offer a preloaded products database with the most popular barcodes already set up. If your manufacturers or suppliers can provide a spreadsheet of product details, we can also offer a data import and conversion service to preload the products onto your Epos System. New barcoded products can be set up on the system as and when required. With stock control, you can accurately track item sales as well as remaining stock levels. This helps with re-ordering so you can automatically be aware of which products need to be ordered and replenished. You can optimise your stock holding and cash flow by not holding too many slow moving items yet not missing out on sales of the most popular stock items. Stock control also helps identify losses and theft of stock. If you have multiple branches, warehouses, stock locations or mobile sales teams then stock control allows you to check where all the items are. It also gives your accountant an instant valuation of all your stock for insurance and balance sheet purposes. Our advanced retail systems link the stock control system with the suppliers database and purchase ordering, helping you to automate these functions within your business. With new stock deliveries, the quantities are booked into the system either individually or automatically if you have used the purchase ordering functions. Periodic stock taking can be done by key-entry or using a handheld PDA with integrated barcode scanner. The POS system can then print a list of stock discrepancies. You can also make adjustments for damaged, outdated or expired stock items. With most of our retail till systems for convenience store businesses, you can opt to print either a mini receipt, an A4-size invoice or both. This gives you flexibility depending on the type of transaction. For example, on small low value cash sales, you may wish to print a mini receipt. But for trade customers, account customer or high value transaction you may wish to print an A4-size Invoice. You can determine how many copies of invoices / receipts to print, you can re-print duplicates and also print Credit Notes and refund receipts. Sales analysis reports are one of the key benefits of an EPoS system. You can produce financial reports that show your daily, weekly or monthly takings. You can produce product-related reports that show sales by individual item, brand or product category. You can produce staff-related reports to show sales performance of each staff member. Sales reports by time of day give you an hourly sales breakdown so you can see which are the busier times of day, showing the number of transactions and the value. On our advanced POS solutions, Gross Profit reporting shows you the gross profit on each transaction by taking into account the cost price and selling price. If you purchase stock from different suppliers at different prices, various models are available to calculate the cost, either on an average cost price basis or on a first-in first-out basis. If you operate credit account facilities for some or all of your retail or trade customers, then our advanced POS systems allow you to operate a sales ledger that will keep track of all invoices, credit notes, payments and refunds. It will also allow you to produce Monthly Statements and Debtors Reports. You may specify a credit limit and operate different pricing levels. If you have repeat clients, then a customer database allows you to store all their contact details, maintain a transaction history, operate customer-specific pricing and discounting (on our advanced systems) and operate a Loyalty Points scheme. CRM features allow you make continued notes and set reminders and prompts for future sales and customer-service activities. If you run a telesales operation, then the optional Telephone Caller ID Module allows a customer record to be immediately located when the phone rings. On our advanced POS Systems, using the back office module you can design and print your own Shelf Edge Labels. This saves you having to price label each stock item individually and makes your store more customer friendly with professionally printed labels on the shelf edges. We also offer stand-alone Windows software to print shelf edge labels onto A4 label sheets. If your retail products are not barcoded by the supplier or if you produce your own products, then many of our Retail POS Systems provide the option to add a barcode label printer to print your own barcode labels using a desktop label printer and label rolls. The label can accomodate the product description, price and barcode as well as your company name, website and phone number. Labels can be attached directly onto products, onto packaging, onto tags or kept on a chart / booklet near the till. With our Fashion EPoS Systems, we provide a high-resolution printer option to print miniature Jewellery Labels (known as Butterfly Labels). These are suited to small items of jewellery, sunglasses, watches, gifts and accessories and other such items. If you operate multiple retail branches, then our advanced retail EPoS Systems allow branches to be interlinked in real-time over an internet connection. You can share customer details and check stock levels at each branch. At the main branch or head office, you get an instant overview of sales performance and stock levels at each branch. With our advanced convenience store epos systems, it is possible to program in special deals, promotions and other discounts for automated price calculation. It also allows for mix and match offers such as "Buy 1 get 1 free", or "Buy 3 for £5" and "Buy any sandwich, crisps and drink for £5" type of offers. Friday 19-April-2019 23:19 Our office is currently closed. We will be open again from 10am tomorrow.